The Samsung Galaxy Tab E Lite is a popular line of tablets running the Android operating system. We are going to look at home and car mounts for the 7-inch model of Samsung Galaxy Tab E Lite. Typically, the Samsung Galaxy Tab E Lite will normally be used at home or in the car. Generally speaking, this is a tablet used for entertainment purposes. It’s not normally used to run driving apps such as Waze. So for the car, we’ll concentrate more on mounts to entertain back seat passengers. Before selecting a mount, be aware of the measurements of the Samsung Galaxy Tab E Lite. This tablet measures 7.61 x 4.58 x 0.38 inches. It weighs .68 pounds. These measurements are important in selecting a properly sized mount. There aren’t any custom holders for the Samsung Galaxy Tab E Lite that we are aware of, so you will likely need to select a mount with a universal cradle. Be sure it will open wide enough to fit this tablet. Adding a case is always recommended to keep your tablet safe so be sure to add the dimensions of the case or skin into your size calculation. Now on the Samsung Galaxy Tab E Lite mount discussion. In the back seat, a headrest mount is always best. There are two kinds of car headrest mounts for tablets. The most common mount will attach to the two posts of a single seat and with the tablet placed between the posts. Perfect height for little backseat passengers and far enough away so that the tablet cannot be turned into a Frisbee. These mounts come in a wide array of qualities. 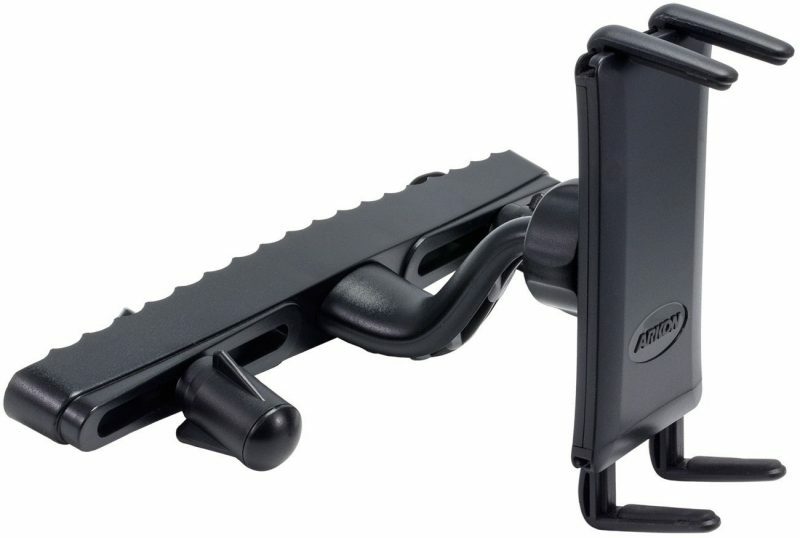 Consider the Arkon Midsize Tablet and Smartphone Car Headrest Mount for the Samsung Galaxy Tab E Lite. The expandable cradle opens to over seven inches which means it will fit the shorter 5.3 dimension of the tablet. There is swivel at the back of the cradle to allow you to get it angled in the direction of the backseat passenger. That’s the mount in the photo that accompanies this article. A spare cup holder makes a great place to mount your tablet. Consider the iKross Tablet and Cell Phone Cup Holder Mount as an excellent choice for your cup holder. There are a few nice advantages with this mount. It comes with two cradles. One to fit your tablet and a smaller cradle to fit your phone. The tablet mount expands from 7 to 10.2 inches. It will fit the Samsung Galaxy Tab E Lite with or without a case or skin. The cradle can swivel 360 degrees into either orientation. The mount has a 10-inch arm that can be adjusted at the base and tip. These fit cup holders to 3.75 inches. What about for use at home? You want something to facilitate watching streaming video or video chat. The CTA Digital Height-Adjustable Gooseneck Floor Stand for 7-13 Inch Tablets is an adjustable mount for using your tablet at home. This mount is useful in the kitchen for recipes, living room for video conferencing or bedroom for watching videos. This beats laying down with the tablet sitting upright on your chest or leaning against a wall. This stand includes an adjustable cradle that opens to hold your Samsung Galaxy Tab E Lite tablet from opposite corners. The cradle can rotate so you can use it in landscape or portrait mode. The overall height is adjustable to 57 inches tall. A flexible shaft allows additional adjustment possibilities. A clamp mount is great for attaching your Samsung Galaxy Tab E Lite to a table, desk or chair. Consider The Joy Factory Unite Universal Carbon C-Clamp Mount for Tablets which features a cradle that accommodates tablets with 7″ to 11″ displays. The mount uses a 6″ carbon fiber arm with a ball and socket connection for adjusting the angle. As delivered, the clamp opens to 1.67 inches to fit most spherical or flat surfaces. If you need the clamp to open wider than 1.67 inches, it can be extended by unscrewing the bottom of the clamp and re-attaching to relocation holes located further down on the top part of the clamp. Now isn’t that better than holding the Samsung Galaxy Tab E Lite in your lap?